Rat Control Treatment Pack 2 contains all the rat pest control products that you will need for killing, stopping and getting rid of a medium infestation of rats. Our Rat Control Treatment Pack 2 can be of use indoors or outdoors. Our Rat Control Treatment Pack 2 is ideal for use where children or pets re present because the bait blocks are held in tamper resistant boxes. Please Note: The rat poison supplied in this Rat Control Treatment Kit 2 contains an attractant that encourages rats to take up the baits more quickly. 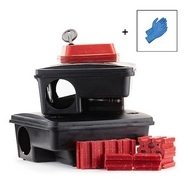 The rat poison bait boxes are weather resistant but the bait trays, if used outside, should be protected to avoid weather damage to the rats poison.